The Reserve Bank of Australia (RBA) meeting may keep AUD/USD under pressure if the central bank alters the forward-guidance for monetary policy. Recent comments from Governor Philip Lowe suggest the RBA will adopt a more dovish tone in 2019 as ‘available data suggest that the underlying trend in consumption is softer than it earlier looked to be,’ and the central bank may show a greater willingness to further support the economy as the ‘progress towards our goals was expected to be only gradual.’ In turn, a batch of a dovish comments from Governor Lowe & Co. may trigger a bearish reaction in the AUD/USD exchange rate as it fuels bets for a rate-cut. 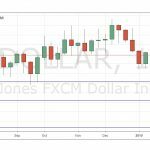 However, more of the same from the RBA may undermine the recent weakness in the Australian dollar especially if the central bank reiterates that ‘there was not a strong case for a near-term adjustment in monetary policy.’ Sign up and join DailyFX Currency Analyst David Song LIVE for an opportunity to discuss potential trade setups. 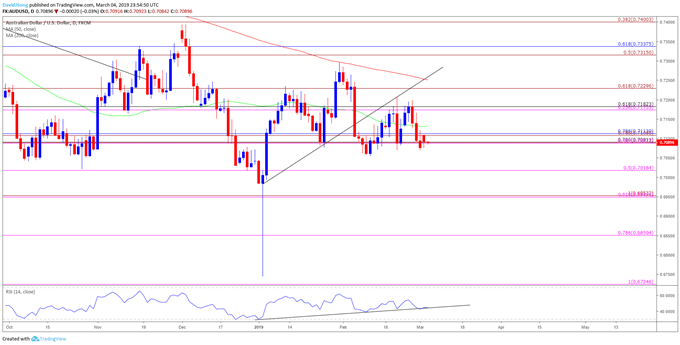 Nevertheless, the lack of dovish comments generated a bullish reaction in the Australian dollar, with AUD/USD advancing from the 0.7200 handle to close the day at 0.7233. Learn more with the DailyFX Advanced Guide for Trading the News. Keep in mind, the broader outlook for AUD/USD remains tilted to the downside as the flash-crash rebound stalls at the 200-Day SMA (0.7253), with the Relative Strength Index (RSI) at risk of highlighting a bearish trigger as the oscillator comes up against trendline support. In light of recent price action, the February range remains on the radar amid the failed attempt to close above the overlap around 0.7170 (23.6% expansion) to 0.7180 (61.8% retracement). Another closing price below the 0.7090 (78.6% retracement) to 0.7110 (78.6% retracement) region raises the risk for a run at the February-low (0.7054), with the next region of interest comes in around 0.7020 (50% expansion) followed by the 0.6950 (61.8% expansion) area.